Chad Gay, of Elida, enjoys driving his 1961 Chevy Apache C10 pickup he found on Craigslist. 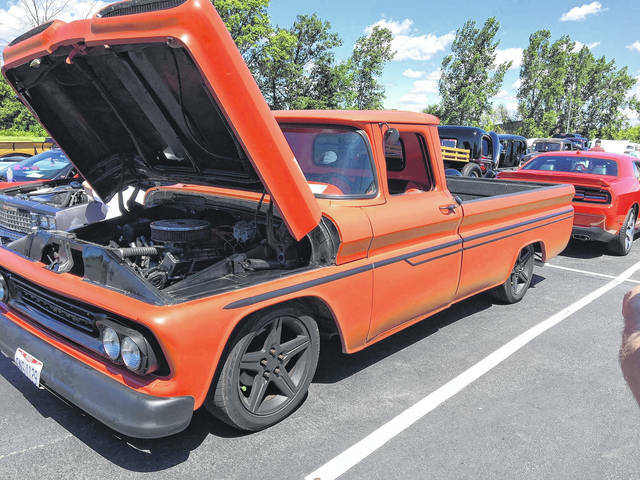 ELIDA — Chad Gay, of Elida, has owned this 1961 Chevy Apache C10 pickup for two years. Gay brought his beauty to the Lima Auto Mall Charity Car Show in June. “I was looking on Craigslist for a car, and one night this just popped up. I said, ‘I have to have it,’” Gay said. Chevy introduced the C/K line of pickups in 1960. This series of trucks included what is known as a drop center ladder frame. This allowed the cab to sit lower, which in turn made the driver feel as if they were in a car. The lower stance included a front end featuring “jet pod” eyebrows over the grille. Chevy dominated the pickup market during the ‘60s, setting sales records in 1964, 1965 and 1966. Chevy experts recognized that pickups in the ‘60s were being used for a variety of roles, not just work. Gay says he takes the truck to car shows and received a top 100 plaque last year. Gay isn’t afraid to drive his truck. “I use it. Not in snow, but when it’s cold,” Gay said. https://www.limaohio.com/wp-content/uploads/sites/54/2017/12/web1_1961-Chevy-Apache-Pickup.jpgChad Gay, of Elida, enjoys driving his 1961 Chevy Apache C10 pickup he found on Craigslist.